Former world bantamweight champion Ryan Burnett will make his return to the ring in his native Belfast on 17 May. Burnett will box in MTK Global's bill at the Ulster Hall in his first contest since losing his WBA bantamweight title against Nonito Donaire in November. The 26-year-old will move up to super-bantamweight as he faces another Filipino Jelbirt Gomera for the WBC international belt. "I want to be world champion again. Nothing else matters," said Burnett. "This is a significant step in that campaign and I'm delighted it's taking place in my home city." 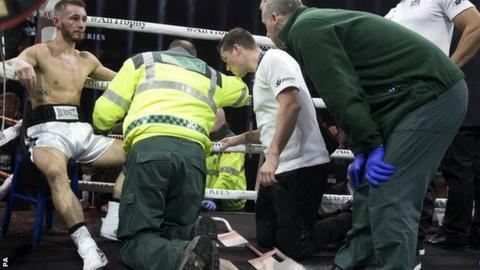 Donaire ended Burnett's unbeaten professional record in the World Boxing Super Series quarter-final in Glasgow when the Belfast man was forced out of the bout after the fourth round by a back injury. Burnett won the IBF world bantamweight title by outclassing England's Lee Haskins in June 2017 and added the WBA belt by dethroning Kazakhstan's Zhanat Zhakiyanov four months later. The Belfast fighter won his opening 19 professional bouts before losing against the Filipino great. Gomera, 26, has been defeated in five of his 19 professional fights. After winning his opening 10 contests, Gomera has lost five of his last nine bouts, although he has held two versions of his country's featherweight title - including the Philippines Boxing Association which he won against Lloyd Jardeliza in November. The 17 May bill will also include Belfast man Marco McCullough's IBF European super-featherweight challenge against Dubliner Declan Geraghty.